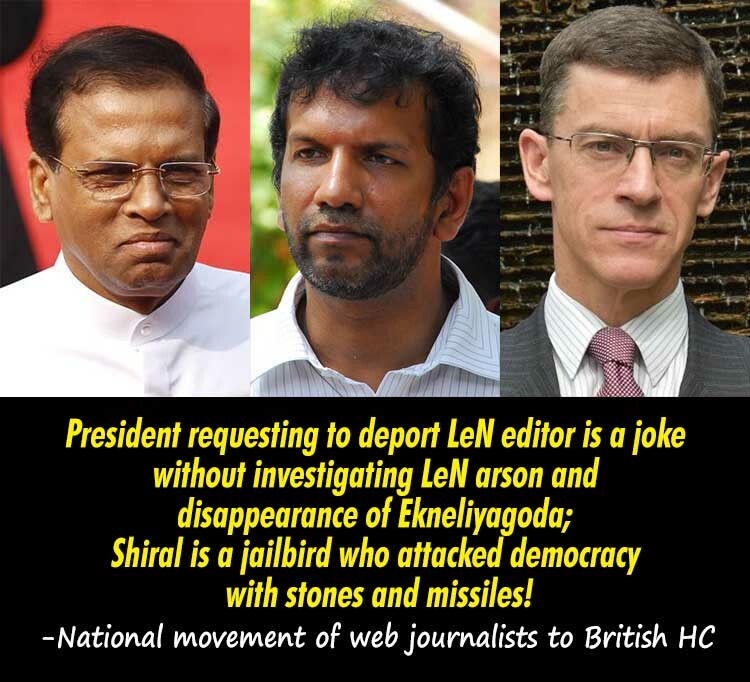 LEN - www.lankaenews.com | President requesting to deport LeN editor is a joke without investigating LeN arson and disappearance of Ekneliyagoda; Shiral is a jailbird who attacked democracy with stones and missiles! President requesting to deport LeN editor is a joke without investigating LeN arson and disappearance of Ekneliyagoda; Shiral is a jailbird who attacked democracy with stones and missiles! Criminal intimidation , criminal trespass, and unlawful assembly over the stoning and attacking of a main Democratic Institution – the UNP headquarters , the National movement of web journalists had highlighted to the British High Commissioner. The National movement of web journalists had urged the international community therefore to investigate the murder of about 250 journalists during the last two decades without allowing president Sirisena to indulge in empty rhetoric and brags. Sundaytimes dated 10 May 2018 reported, British High Commissioner Mr.James Dauris summoned to President Maithripala Sirisena’s Paget Road residence.and requested Britain to arrest or deport editor of LankaeNews. Further sundaytimes reported, Mr. Shiral Laktilleka too presence for the session. It is worth to note Shiral Lakthilaka is a person who was remanded on charges of unlawful assembly, trespassing, and criminal intimidation thus cast stone to the UNP headquarters, the biggest democratic center in the country. During dark regime of Rajapaksha’s, although Lankaenews office burnt down, Prageeth Eknaligoda whom cartoonist and political analyst reported missing, To date No conclusive investigation been taken. Facts being so,It is very ironical Sri Lankan President requests Britain to arrest or deport editor of LankaeNews, More ever Sirisena whom promised to end an era of draconian restrictions on the country's media. We are nothing but well witnesses for murdering of 250 plus journalist during last two decades. It is a tragedy that staying our nation and international community as a mute spectator cover their eyes, tied hand back. The National movement of web journalist, calls up the international community, Not only requests President Sirisena to stop the charade also demand conclusive investigations into attacks against the media. All inclusive nothing but safe guard our press freedom.